The 11th annual presentation and educational event on the main trends and potential of advertising and print – “Den Signmaking Bratislava” will take place in the Bratislava Refinery Gallery. The event in the capital of Slovakia will take place on October 10th, from 10am to 5pm. Of course, EffeTec s.r.o., which is a purely Czech company producing large-scale UV printers, can not miss the action. EffeTec s.r.o. We are a proud member of the Signmaking Association, which brings together a wide range of companies from the Signmaking Environment. For this important event, EffeTec s.r.o. has prepared a presentation with a focus on the company’s activities, which will include a sample of its own products. This presentation is intended not only for the customers of the company, but also for the wide professional public. Another model offered by Effetec is SimpleJet – https://vimeo.com/152063317, again it is a Flatbed, but also with Hybrid designation. This machine excels in the high quality of printing and other advantages that users most often require from the machine. 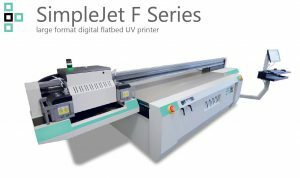 Both series of printers, whether EffeJet or SimpleJet, have their strong side in the ability to customize their parameters according to the wishes of each individual customer. For example, the possibility of printing plate materials up to a thickness of 100 or 150 mm, roll to roll options, the possibility of attaching different products, increasing the printing height, adjusting the printable dimension, using different types of ink and automation for industrial applications. In addition to producing UV printers, Effetec can upgrade some printers with advanced electronics and print heads. In cooperation with Cettec s.r.o. carries out service and sale of spare parts. With the specialized company Vink Plastics, we also deal with these machines for the most appropriate use of inks for individual underlying materials. More detailed information can be found not only on the website of Effetec s.r.o, but also on the already mentioned Singnmaking Day in Bratislava. After some time, the presentation and educational one-day exhibition “Day of Signmaking” will be returned to the Slovak market. The event will take place in the same format as in the previous years, when it took place in Brno. Emphasis will be placed on training seminars focusing on education. Lectures will take place in the morning and afternoon sessions. Lectures will correspond with practical demonstrations of technologies (workshops). Individual exhibitors will be provided with presentations, where the themed demonstrations, presentations and workshops will be shown to visitors. Effetec s.r.o. will also actively participate in these events. In addition, they will enrich their presentation with a demonstration of their machines during printing operations. We would like to invite you to this very, very certainly, very interesting event.